In line with our Follow The Money works in ensuring efficient governmental employment of public funds for primary healthcare provision, CODE partnered with One Campaign, Network of People Living with HIV/AIDS and Well Being Africa on hosting a Citizens’ Mega Town Hall Meeting (MTHM) with the Senate President, Dr. Bukola Saraki, on 1 December 2016. This MTHM was to mark World AIDS Day (#WAD) and also promote public healthcare access. The World AIDS Day, observed on every 1 December has been an important day globally as it provides an occasion to highlight the importance of investing in health systems and care to make sure that no one dies needlessly particularly from HIV/AIDS. 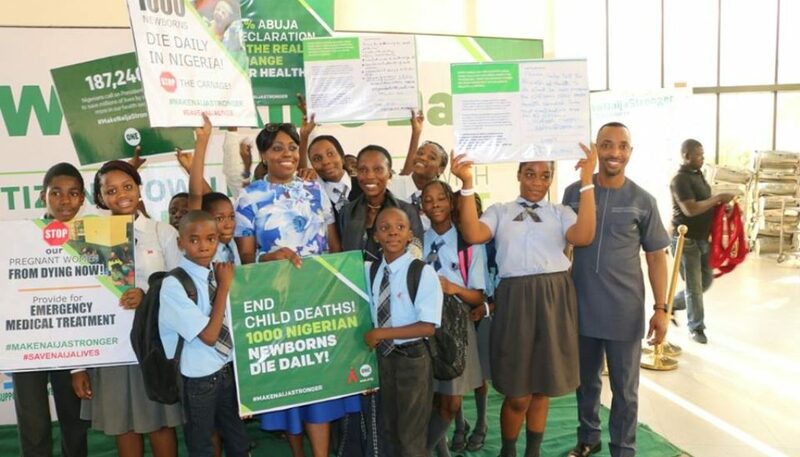 ONE has been campaigning to build a case for why the Nigerian government should invest more in the health sector to improve service delivery through its #MakeNaijaStronger Campaign (see https://www.one.org/africa/take-action/make-naija-stronger/). The WAD 2016 then provided a key moment to help connect citizens with key policymakers especially in the National Assembly that can make a difference in ensuring the right investments in the health sector. The MTHM was held at the NAF Conference Centre Abuja. It was also an opportunity for Nigerian citizens to directly engage the Senate President and other legislatures on stronger institutional oversight. In attendance were the Senate President, and some other legislators; representatives from the Nigerian Medical Association, Health Sector Reform Coalition, market women associations, youth groups, Nollywood actors such as Desmond Elliot, Waje, Denja Abdullahi; and students from several schools. The event started with various emotional presentations on the cost of poor healthcare access in the country. CODE on its part made a presentation on its monitoring of the implementation of capital funds for the rehabilitation of PHCs around the country in Akwa Ibom, Enugu, Kano, Kogi, Osun, and Yobe states. Part of the funds include the $1.5 million health grant from the World Bank to each of the 36 Nigerian states & the FCT in its Save One Million Lives Program; and the N10.5 earmarked by NPHCDA for the rehabilitation of a PHC in Afia Nsit Urua Nko, Akwa Ibom State. CODE’s presentation also accentuated the reprehensible state of PHCs around the country with empirical evidence from our field visit. It also pointed out that there is no sort of implementation going on with respect to the funds and that governmental agencies are so lackadaisical in replying FOI Requests on further perspicacity on these funds. CODE, through the presentation finally called on the Nigerian Federal Legislators to pay further attention and monitor funds that are intended for communal healthcare provision in their oversight duties. The Senate President, at the occasion was petitioned by Nigerians on issues regarding poor primary healthcare provision and transparency challenges in the health sector. The petition, signed through about 8,000 postcards and online, was presented by Desmond Elliot, a popular Nigerian actor and lawmaker of the Lagos State House of Assembly, Surulere Constituency to the Senate President on behalf of Nigerians. The core of the petition was to ensure that 15 per cent of total national budget is allocated to health sector development. The petition also asked the government to invest one per cent of the consolidated revenue fund into the development of the primary health care scheme. The Senate President received the postcards and expressed his understanding with the healthcare need of the people. It is believed that through this, there would be increased legislative oversight over primary health care funds implementation as well as several bills to ensure quality primary healthcare provision in the country.